An adventure for characters of 1st-2nd level, intended to be run in a single session. 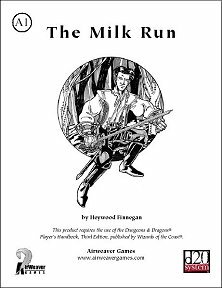 Publisher's blurb: "This adventure takes place along and near a trade road that travels through a humanoid-infested forest and may be adapted into most campaign settings with only cosmetic changes. The set-up of the story easily allows for this adventure to be a group’s first adventure together. The scenario is combat heavy and is designed to pull a group of inexperienced heroes together in a trial by fire." Thanks to Air Weaver Games for making this available! Available FREE from the Air Weaver Games website, click HERE to get your copy.